The children of Bright Sparks Montessori celebrated Beep Beep Day in conjunction with National Road Safety week. Garda Joe Sullivan and Garda Caroline Hennessey, along with paramedic Vanessa O’Sullivan, popped by to see how much the children had learned and to show them around their emergency vehicles. A great day was had by all and a huge thank you to them for giving up their time to come and visit. 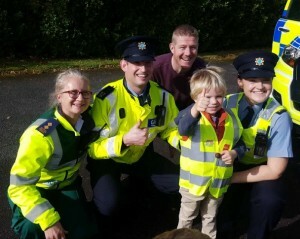 It was an extra special day for little Sam O’Sullivan as his aunt and uncle Garda Ken O’Sullivan and Paramedic Vanessa O’Sullivan were among the visitors and he was delighted to pose for a picture with them and Garda Joe and Garda Caroline.